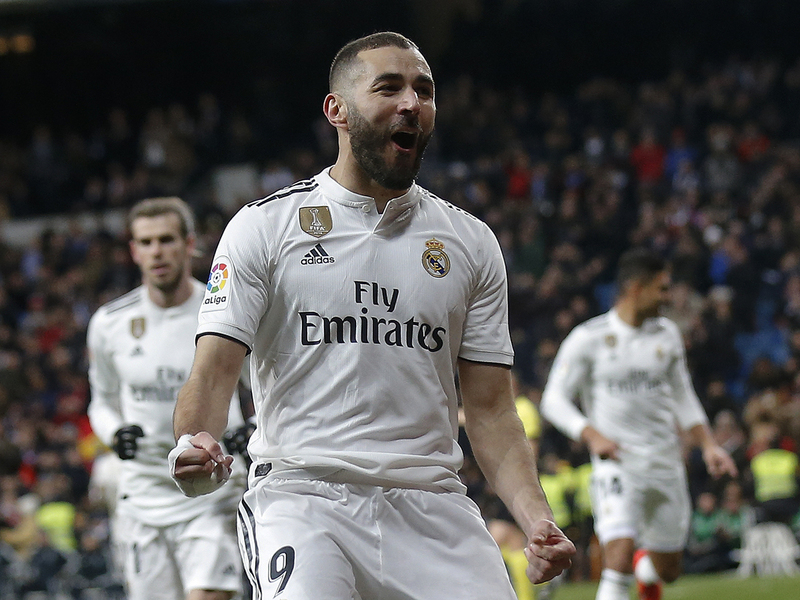 Madrid: Real Madrid gained ground on both Barcelona and Atletico Madrid in La Liga as Karim Benzema and Vinicius Junior each scored in a 3-0 win over Alaves on Sunday. Benzema, Vinicius and Gareth Bale started together for the first time and two thirds of the newly-dubbed ‘BBV’ delivered as Madrid capitalised on Barca being held by Valencia and Atletico losing at Real Betis. Mariano Diaz, on as a substitute, added a third late on. After 22 rounds, this is the first in which Madrid have been the only winners from the established three clubs, which is as much an indication of their own inconsistency as the sturdiness of Atleti and, particularly, Barca. Madrid could now overtake Atletico if they win the city derby next weekend but the difference behind Barcelona, whom they face in the Copa del Rey on Wednesday, is still a considerable eight points. It may have been the 5-1 loss to Barca in October that proved the final straw for Julen Lopetegui but Alaves’ 1-0 victory at Mendizorrotza, their first over Real in 87 years, was perhaps the team’s rock bottom. Benzema has been the revival’s ringleader since and his latest goal was his sixth in four games, his best streak since January 2016. The only La Liga player to have scored more in all competitions this season is Lionel Messi. He did it starting alongside both Bale and Vinicius but it was the latter, not the former, that looks to be Benzema’s most dangerous partner. Bale endured one of his quieter nights and it was noticeable that while Benzema and Vinicius both departed to rousing ovations late on, there was a scattering of disgruntled whistles when the Welshman was replaced by Marco Asensio shortly after the hour. It was Vinicius’ clever reverse pass through the legs of Carlos Vigaray that led to Benzema’s opener as Sergio Reguilon was set free down the left, his cross ensuring the Frenchman could not miss. Alaves defended so deep at times that Madrid’s defence were playing more as creative midfielders but the visitors were not without chances on the break. Tomas Pina took too long to shoot and Jony Rodriguez forced a smart save from Thibaut Courtois. Madrid, though, ended any hopes of a comeback with 10 minutes left as Asensio picked out Vinicius at the back post. The teenager controlled, picked his spot and put it there. Mariano’s diving header in injury-time from Isco’s cross added a final flourish. Earlier, there had been another first for Atletico up front as Alvaro Morata made his debut but it ended in disappointment after a 1-0 loss to Real Betis. Atleti could have reduced the deficit to three points at the top but Sergio Canales’ second-half penalty means that Barcelona finish the weekend one point further ahead than when they started it. Morata enjoyed the occasional link on the counter-attack with Antoine Griezmann but there was little to suggest the pair’s chemistry will be instant. Diego Costa is expected back from injury soon. Morata has limited time to stake his claim. Betis’ penalty came after Filipe Luis put his hand up while anticipating a cross and looked away at the crucial moment. Canales’ shot clipped Jan Oblak’s hand but nestled in the corner.